I just returned from Kota Kinabalu but I'm afraid an update about the trip will have to take a backseat as I want blog about someone very dear to me. 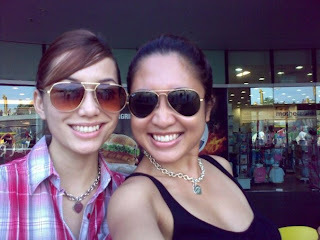 Diana and I have been friends since we were 14 and we remained in contact throughout these years. Since we lived just a few blocks away, there were a few ocassions during the exam period when Diana would settle Nyla's dinner and then send Nyla home because I simply was going crazy in school with the markings and all. Diana is a very understanding friend with such a big heart and a great sense of humour! I am very lucky indeed. Nyla and I managed to visit her just now, this time, the mood was pretty sombre. My babe actually thought her godma was just going on a holiday and will be back in a few days because she was asking which hotel she was staying and whether there's any bathtub bla bla bla. Oh God, Nyla will miss her godma terribly when she realises that the days will turn to weeks then months.. Sigh, I am tearing as I am typing this. Na, I'm sure you will be reading this. Please take good care of yourself and baby Danial. You will be missed, my best friend. And hey, in case I never mentioned this, I love you my bestie superspy. Till we meet again. HUGS. I am a sucker for OK magazines, Australia's version. Not too thrashy like the other tabloids, I like. Nyla, on the other hand, loves the adverts. So, I had to explain to her that the print ad wanted women (and nyahs) to buy the bra on that headless body. Noticing that Nyla will also flip through the magazine whenever I brought it home, a marvellous idea struck me. Every week AFTER I have finished an entire OK (which can be done easily within 3 hours!) I would choose a print ad, tear that ad out and plan something fun for my little missy. Just last week, we did something very interesting and it lasted us a good 45 minutes. There was cutting, matching, sorting and pasting. Yippedydooo! I can't wait to do my lesson plan this Thursday! Hehe! How did it get to already more than a decade since we all graduated from high school? Anyhow, cheers to these peeps, who, in one way or another, has helped me get a running start towards my life's journey of ups and downs. We shared so many moments of "Do you remember....?" Do you still remember how Yu Li swung his 'soaked with smelly sweat' PE t-shirt and how that disgusting sweat drizzled and sometimes, rained, on those who sat near him? Thanks ah! Do you still remember how the boys (and protective gfs who would dig their eyeballs out if they could) would just segregate around the basketball court just to watch Nita do her shuttle run? Bet, Jo, your husband now, was probably one of those horny guys who ranted " Go boobies go! Wooohoooo! Yeehaaaa." Do you still remember how Megat unleashed his super power on a classmate's back? Yeouch. And you got an a distinction for English thanks to 8 Days? Really?! Do you still remember how Zul always walked around the classroom with his comb just so that the jambul stayed? Do you still remember how yours truly was very misunderstood by a teacher who accused her of having a love bite on her cheek when what she had was fungus (eewww, i know) diagnosed by the doctor. Bleargh. I was pretty much overwhelmed by nostalgia when I caught up with them. There were howls of laughter and tears as we recollected how silly we all were and we actually thought we were the coolest bunch of express kiddos ever. Yeah right?! Anyway, superb time ya all. And how can I forget this one girl whom I left behind in 1995 and moved on to form new friendship with the people mentioned above. It sure feels great to be reunited with you too, babesy. I sayang-ed you then and will always sayang you, my Ana Hayer. PS: Thanks for adding the 'shine' back into my life. Heh! Ultimately, the brain is too exhausted to craft a wordy blog entry so I'll just let the pictures do the talking ya. Thursday: Little Big Club Live in Concert. Thanks to Bah and Netty! Barney and the gene gang. Nyla rehearsing before the concert. This is the character she was most looking forward to because we've read a couple of Angelina Ballerina books. Just one picture taken because bulk of the time was spent on gorging on food. Sunday: Zoo with Joe and family. The papas and the kiddos. Water play! Highlight of the day! With that, I thereby hit the sack. Nites! Nyla is able to speak most comfortably in English, however, I am ashamed to say that with regards to Bahasa Melayu, it's berterabor. Nyla's halting Malay has called my entire family to place an emphasis on literacy such as reading Malay books and speaking more frequently in Malay. Then, I was very proud of Nyla for mastering English language pretty well. Well, my mom has mentioned several times that my vocabulary skills were nowhere near hers when I was four. Mom, you didn't stimulate me enough ah?! But then again, kids nowadays are very very smart, don't ya all think? 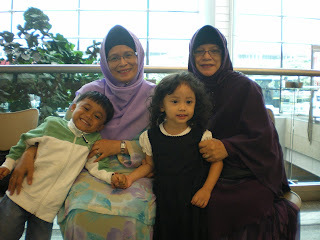 Wak Gayah and my mom with their respective grandkiddos. Anyway, one of my most favourite aunties who is a Malay Language teacher, Wak Gayah, was sharing with me on the importance of Bahasa Melayu because she noticed a very worrying trend among the Malay pupils at present. If previously, the Malay pupils could so easily attain As for their Mother Tongue, it is not the case for today's kids. She is currently teaching the Lower Primary kiddos and many of these Malay pupils are struggling with their Bahasa Melayu. Just a few weeks ago, Wak Gayah said "Kin, kau jangan nak speaking je dengan Nyla. Nanti budak tu masuk primary school, susah nanti." And of course, my mother, Puan Rokiah, nodded her head ever so vigorously and gave me a "See! I told you!" look. Bleah! This made me a bit tersentak. Wak Gayah meant her words so seriously she bought a stack of Malay books for me to read to Nyla the week after. And I must really thank her because Nyla is pretty hooked on those books. Cool stuff! Now, she even attempts occassionally to speak in Malay. Cute stuff! Happy 34th wedding anniversary. Wow. Thank you for being the best ever parents to me and the brothers. Thank you even more for being such awesome grandparents to my babe. Love you two so super duper much. Your only babe who never suffered from the middle child syndrome.